Combine 2 cups water, clam juice, basil, lemongrass, lime juice, fish sauce, and salt in a stockpot; bring to a boil, reduce heat, and simmer until well flavored, about 30 minutes. Meanwhile, combine cilantro and butter in food processor; mix until cilantro is in tiny flecks. Set aside in a small saucepan. Pass liquid in stockpot through cheesecloth-lined strainer. Return to stockpot over medium-high heat. Add clams (use a bamboo steamer if desired); cover pan. Cook until clams open, 10 to 12 minutes; discard unopened ones. Melt the cilantro butter. Transfer the clams to a serving bowl, and strain the broth through a cheesecloth-lined strainer. 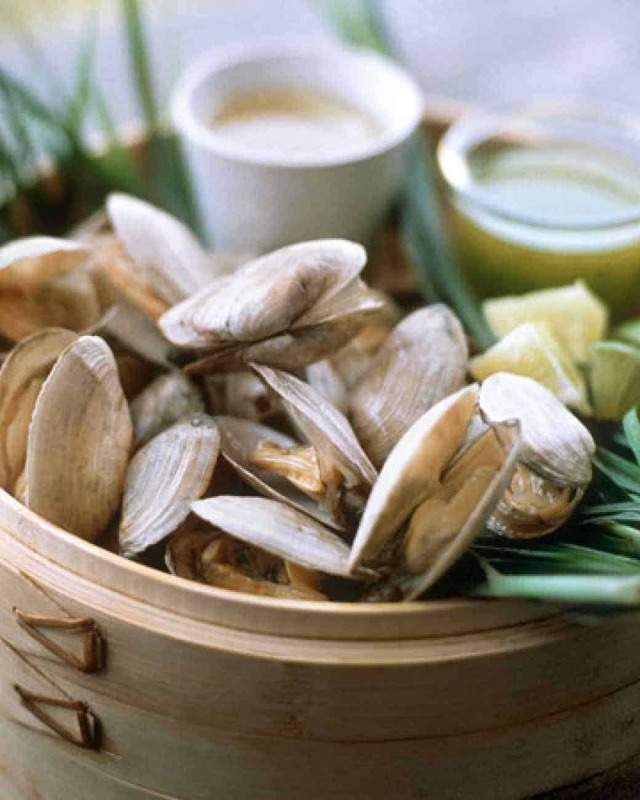 Serve clams with lime wedges, broth for rinsing off sand, and butter for dipping.